I love strawberries. Berries in general are high on my list of favorite foods, but strawberries are at the top. Since they are now available frozen year round I am able to enjoy my strawberry smoothies even in the dead of winter. However, there is something so quintessentially summer about eating fresh strawberries. I love using them in desserts, but they are equally great for adding a hint of sweetness to savory dishes. Whatever the preparation method, any dish with strawberries rarely lasts more than a few hours. Last night I tried a new recipe for Herb Crusted Chicken with Fresh Strawberry Relish from the June 2013 issue of Eating Well magazine. This recipe has 10 ingredients. It takes 1 1/4 hours of total time, 30 minutes of which is active and makes 4 servings. I only made a few changes to the original recipe. Since my herb garden is finally thriving I was able to use fresh oregano from my garden. My 4 thighs weighed exactly 2 pounds and I served the dish over white rice. I added 2 teaspoons of balsamic vinegar since it has great flavor and I love using it with strawberries. Make sure to buy a high quality balsamic vinegar, there really is a difference between the cheap low-quality brands and the top-shelf varieties. The relish in this recipe was delicious. It had even better flavor after sitting in the fridge overnight. Combined with the herb crusted chicken the flavors made a nice sweet-savory taste. My kids loved the relish, so the recipe is a nice option to get kids to eat fruit in a new way. 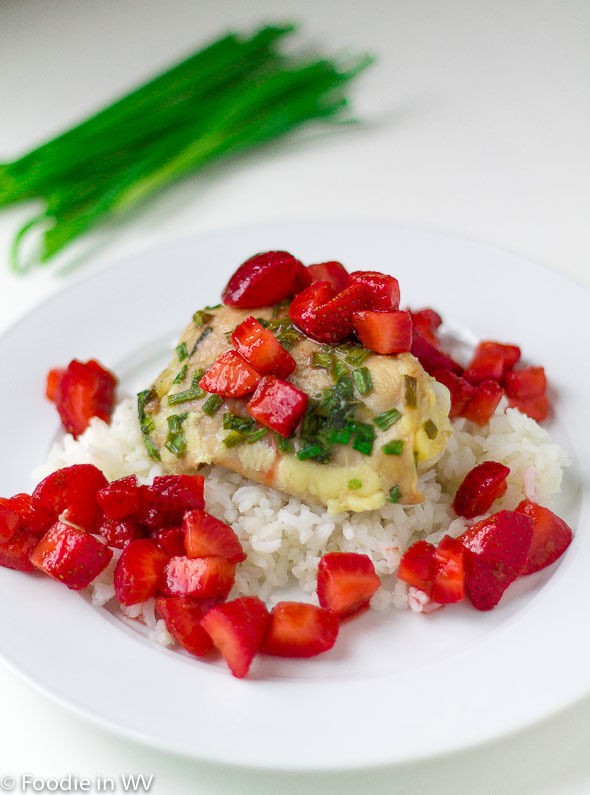 For the recipe go to Herb Crusted Chicken with Fresh Strawberry Relish. Oh how interesting. I never would have thought chives and strawberries would mix. Who woulda thunk it? Strawberries are delicious in savory dishes since they aren't very sweet without sugar added. They tend to take on the flavor of the rest of the dish and with balsamic they are yummy! I am definitively going to try the relish recipe it sounds delicious. Your Chipolte Burger was to die for too. My sister and I are hosting a BBQ Block Party-Linky Party now thru Sunday and would love to have you come and join us with your recipes. Thanks for the sweet comments and heads up :) Going over to check it out now! Basalmic is great with Strawberries. Definitely! There is a really simple recipe from Cooks Illustrated that is great in the summer, very simple and delicious! That strawberry relish definitely sounds like it made this dish! The relish definitely made the dish, it is delicious!